A Life of Sugar and Spice: More support for the grain free lifestyle. I read an article in the Men's Journal last night. Yes, I said Men's Journal. Have you ever read a Men's magazine? The articles are so much better than most women's magazines. The tone is different, I don't know how to explain it, but yes, I do like to read Men's magazines ok? Ok, then moving on. I read this article that talked about this book, Good Calories, Bad Calories: Challenging the Conventional Wisdom on Diet, Weight Control, and Disease. 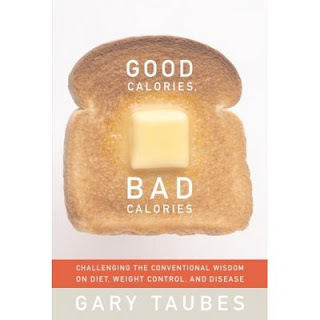 by Gary Taubes. This is not another diet book! This is a book that contains extensive evidence showing that carbs, especially of the refined type, are literally killing our society. Just another step forward in my journey to eliminate grains from my diet. I whole-heartedly support the theories that are out there regarding grains as a detriment to our bodies. I'm living proof that grains wreak havoc on our insides. This book however, talks beyond the intestines and goes even further, talking about heart disease and obesity and so much more. If you're curious, go to Amazon.com and check out some of the reviews. I plan on picking up this book asap and giving it a read. I will definitely tell you what I think of it when I'm done reading it. I still highly recommend Going Against the Grain as well. I know a lot of people out there will think that eliminating grains is crazy, I used to be one of those people, but I'm a believer now more than ever. Oooh. Looks really interesting! I find men's magazine articles more more intriguing too; for some reason they don't get dumbed down as much. Have you read "Dangerous Grains?" It sounds like it's along the same line. I have a copy if you want to give it a read. If you have Crohn's: my (then) 26 year old daughter went into permanent remission of her Crohn's after reading "Life Without Bread," by Allan and Lutz, and implementing a rigorous low carb diet. Anyone with IBD should read this book. Thanks Art! Yes I do have Crohn's and I will read that book. I am definitely a firm believer in eliminating grains for IBD remission. I've been gluten free for 2 months now and the changes have been drastic.